Is there finally a new arts movement for black people? There have been few historically-recognised artistic movements in the western world that have centered black people. The British Black Arts Movement, a radical 1980s political art movement inspired by anti-racist and feminist discourse, helped to secure the rise of artists such as Sonia Boyce and Donald Gladstone Rodney, but in the 21st century this type of mutually beneficial collaboration and platforming in the black community seemed to have resisted definition. Until now. Earlier this year, it became 25-year-old artist and curator Hamed Maiye's mission to coin a term, Afro-Portraitism, and use it to describe a facet of what seems to be a surge in black creativity in the UK and beyond. It explores the art of portraiture within the African diaspora, taking all the connotations portraiture has carried throughout history and applying them to today’s social climate. At its core is self-representation, and the idea that portraiture, often associated with the renaissance era, when royals, public figures and religious characters were those predominately depicted, can be appropriated for the 'ordinary' black person. Working with a selection of artists, photographers, designers and directors, all from the African diaspora (such as stylist Umps Machaka, photographers Liz Knuckles, Hannah Faith and White Negatives, videographers Tunde Awoyemi, Nadira Amrani, Akin Davies Jr., Raine Allen Miller and Seye Isikalu and co-curators Nicole Crentsil and Annabelle Nguyen) Maiye organised an exhibiton earlier in April at Republic in London, but, he says, this is just the beginning of the Afro-Portraitism story. Why did you decide to coin an arts movement? Hamed Maiye: In discussions with friends, we analysed that there was a lack of established arts movements happening at the moment. We spoke about how historically you had Pop Art, you had Dadaism, you had all these movements which were coined. And then we spoke about how there’s sort of a black renaissance going on in our generation that no-one has really coined yet. When do you think you first started seeing it come up? Hamed Maiye: In the past two years, I think. More so in the past year. Who do you think has been at the forefront of Afro-Portraitism so far? Hamed Maiye: My friend IGGYLDN, for instance. 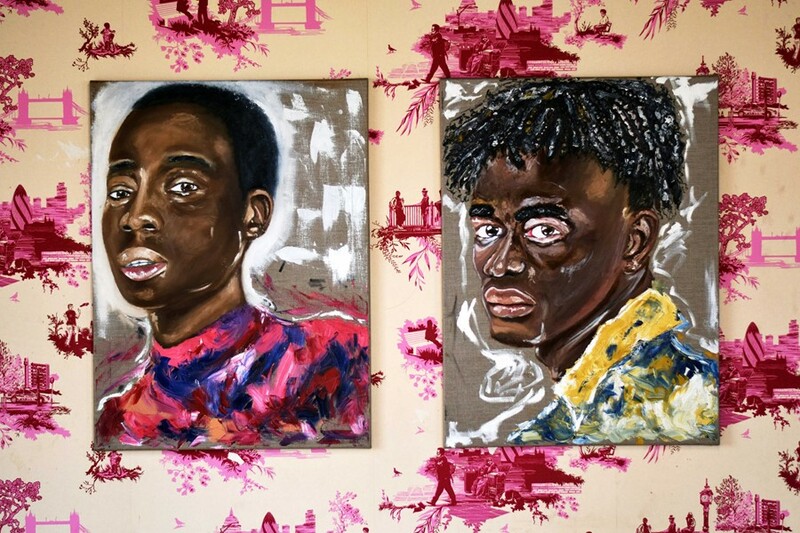 His project, Black Boys Don’t Cry, challenges the narrow conceptions of black masculinity. Black people are putting new narratives out there that people may have found taboo before. There are a lot of fresh conversations going on. How would you describe your own style – you paint? Hamed Maiye: A lot of my work is based on expression and emotion. So each portrait is kind of an interpretation of how I’ve taken that muse or character and just done it in my own style. The way I interpret each character – sometimes I meet them, sometimes I don’t. But it’s just my approach to them. I feel it’s a weird, subconscious practice. I see a character and I already know how I want to express them in a painting and kind of express their identity through my piece. Can you tell me about a specific photograph from the exhibition you’re really proud of or happy with? Hamed Maiye: There’s a shot that I found very powerful where the female character is sitting on a chair and the male character is holding her leg (pictured below), which I found quite interesting in terms of role reversal. It subconsciously creates a new conversation in terms of gender. That photo is probably my favourite and is most reflective of contemporary diaspora culture. I was stalking your Instagram and I saw a picture captioned "Can wear baby pink and still steal your girl". As with IGGYLDN's work, I’m getting this vibe within Afro-Portraitism that black masculinity is being reclaimed? Hamed Maiye: (laughs) Yeah definitely. I guess when I posted that picture it was very much a "my masculinity isn’t fragile" kind of statement – if that makes sense? 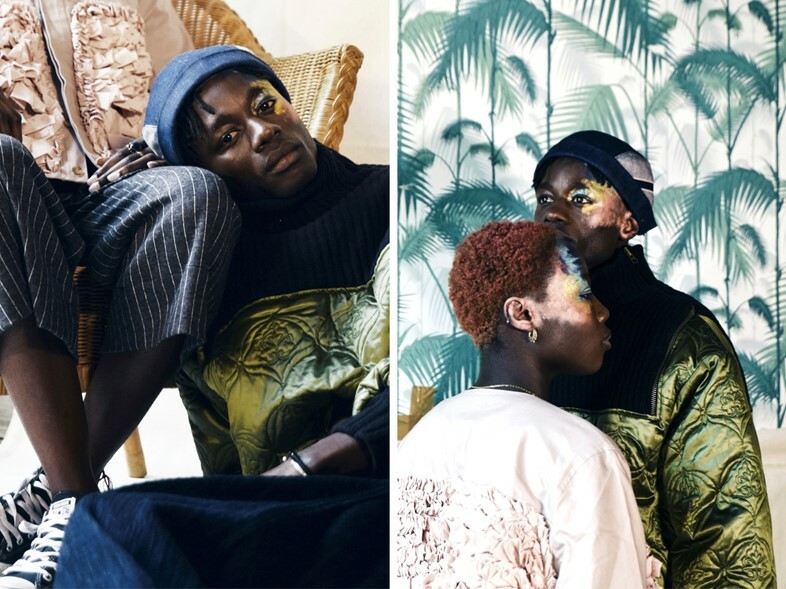 Two of the designers I chose for the project, Bianca Saunders and Jazz Grant, their work is around creating new conversation as to what male fashion is. Why was it important for the opening exhibition to be collaborative? Hamed Maiye: The idea behind collaboration was kind of putting more force into really coining Afro-Portraitism as a movement. I don’t think arts movements can really be done on a solo basis. Everyone I collaborate with, I was familiar with their work before or I know them on a personal basis. So through conversation everyone kind of realised there was this niche and they were very happy to come on-board with it. Hannah Faith flew all the way from Berlin to be a part of the project. Bianca I already knew. Jazz, I just literally reached out to her via email. Umps is one of my really good friends. She does a lot of styling for Kojey Radical. I thought she was the perfect person to tie all the styles together. Just to play devil’s advocate, why is unity so necessary? Hamed Maiye: There's a lot of outside forces and influences which are constantly trying to portray the black community in a certain, negative light. If we come together and represent ourselves we don’t need any sort of validation or to play to any sort of gaze – the European gaze, especially. We just represent ourselves as we are. It’s easier to do that in unity as opposed to as separate forces. At the opening of the exhibition you said black people shouldn't be focusing on the past. Why? Hamed Maiye: I get really annoyed when people tend to live in retrospect in afro culture. As important as it is to celebrate the Martin Luthers and the Rosa Parks – all those people who kind of paved the way for us – I feel like people are afraid to claim themselves as historical now. We’re the same as them. We’re humans. We can create as much of an impact. We just need to claim it. Hamed Maiye: It is! But I very, very much believe it. We are historical. We live in the now. We should act as such. Create new conversations and new narratives. Show the world ourselves as we want to be seen. Hamed Maiye: We're planning to have an exhibition during [the UK's] Black History Month 'cos that seems quite appropriate. But I also want to do more collaborative mini-projects in lead up to that. I hope it’s adopted by other people. I guess that’s the point of an arts movement – for it to be adopted, disseminated and the message spread. That people actually realise that there’s a unity that needs to be had within the arts scene. I saw at the end of one of the films made for the exhibition you’d given Afro-Portraitism a dictionary definition: "Verb/Noun An act of self representation rooted within afro culture. A visual and literary artistic movement." Would it be the dream to have Afro-Portraitism in the dictionary? Hamed Maiye: (laughs) Definitely. It will be in the dictionary.